Plasibox® from Sofrigam is a range of rigid, robust and reusable iceboxes to transport chilled or frozen products. With excellent integral insulation, Plasibox® will maintain products at cold chain temperatures for two days. The Plasibox® is constructed of rigid high density polyurethane panels with special insulation coating, a rigid plastic case and “Rigid Snowgam” eutectic cooling plates. The box can be cleaned with alcohol, chlorinated water or any other disinfectant. With its excellent overall coefficient of heat transfer K and its ability to withstand mechanical impact, the Plasibox® safeguards medicines or other temperature sensitive products from mechanical shock and temperature excursions in transit. Used with cooling gel packs, the Plasibox® can maintain pharmaceutical, biotechnological or food products at stable low cold chain temperatures as low as –5°C and to maintain goods at below 8°C for up to 48 hours. Side handles make the Plasibox® easy to handle. The box lid can also be sealed with an optional tamper proofing system. The Plasibox® insulated box solution is particularly useful forshort-term transportation (maximum of 48 hours) where robust protection, ease of handling and reusability are useful features. Plasibox® was originally developed for an Eastern European warehouse/distributor that needed a reusable temperature-controlled solution in order to deliver temperature-controlled drugs between +2 and +8°C to client pharmacies, hospitals, and clinics, using non-refrigerated vehicles in delivery cycles lasting at least 24 hours and carried out in average ambient temperatures of +25°C. In order to make distribution economically sustainable, the client needed to recover the cooling box after each delivery and store for the next cycle. 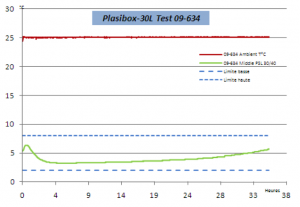 Following initial design and development, the Plasibox® system was tested and qualified by the Ater Metrologie temperature testing lab, an ISTA certified environmental testing laboratory. The packaging was tested by simulating the real climatic conditions to ensure that it could keep temperature-controlled products within approved temperature limits throughout the entire delivery cycle. Test results showed Plasibox® was able to sustain internal temperatures below 8°C for 35 hours at an ambient temperature of 25°C. Click on Plasibox® – rigid, robust and reusable insulated packaging solution for other information. Click on Sofrigam SA to contact the company directly.